"The Drowning Part One: The End of Fear" by Dan Abnett, Brad Walker, Andrew Hennessey, and Gabe Eltaeb. Since I had the good fortune to read Aquaman #1 ahead of its release, this post is coming much sooner than the Shrine's issue reviews normally do. To that end, I decided to change things up a bit by skipping a detailed plot synopsis (and the accompanying spoilers) and just going right to what I thought of it. 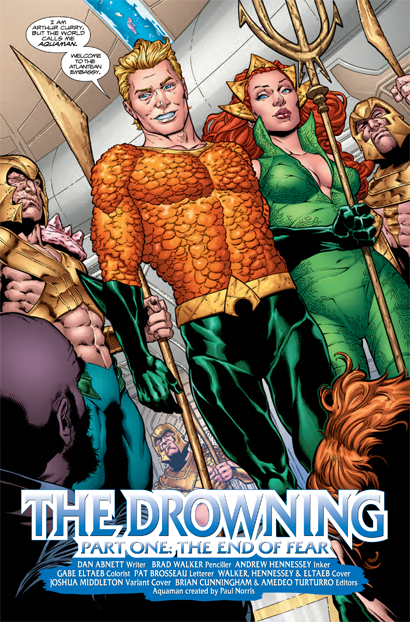 Building upon what he laid down in the last few issues of the last Aquaman series and Rebirth #1, this newest Aquaman title features Dan Abnett giving us a Sea King and Queen who are playing host--both to the Surface Dwellers who are visiting Spindrift Station for the first time and any potential new readers who are giving a Aquaman comic a try for the first time. 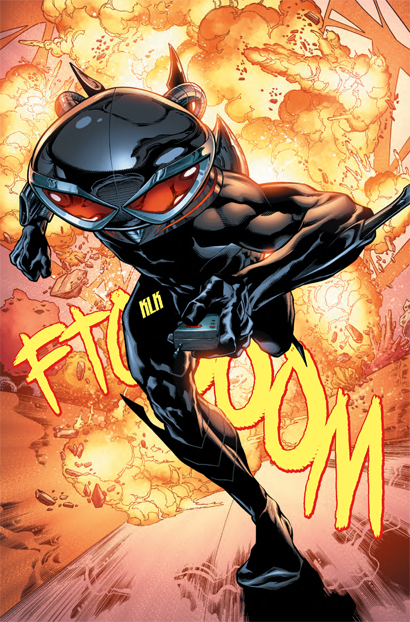 Aquaman's #1 foe, Black Manta is on hand again. But instead of just trying to kill the Sea King, he has a more long game plan in mind--destroying Aquaman's image to the world, just as he is trying to rebuild it after the events in "Throne of Atlantis." 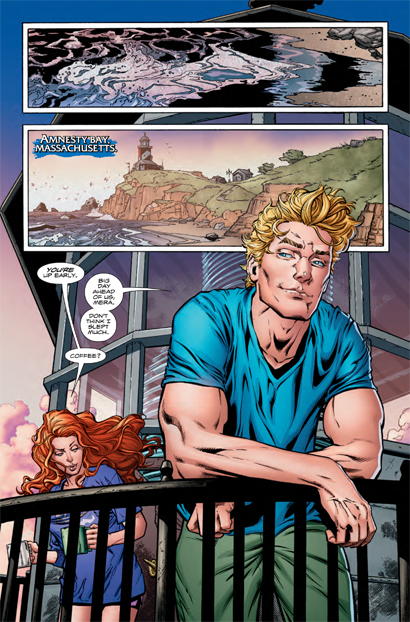 The Surface World has always been iffy on Aquaman (shown here, from multiple POVs), so Manta figures he'll let that distrust do the work for him. After so many failed attempts at killing his arch foe, I'm happy to see Manta trying something new! I think I've said it every month since its introduction, but I really like the addition of Spindrift Station. It helps cement Aquaman in one location, something his fellow JLAers have taken advantage of for decades. 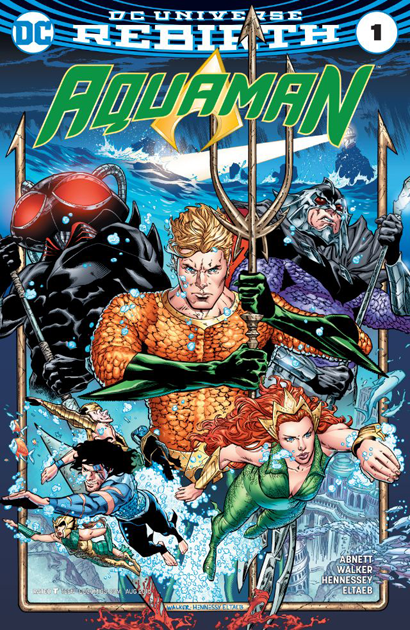 It doesn't mean Arthur has to be stuck to it, but I think it's an ideal way to set up stories, add in supporting characters, and give Aquaman and Mera a consistent place to engage in superheroics without being bogged down with Atlantean politics (those damn Plankton Farmers!). I was happy to see this whole issue taking place there, though I think they need to work on their internal security a bit more. Art wise, I thought Brad Walker and Andrew Hennessey made a solid team (assisted on the colors by Gabe Eltaeb). Walker's Aquaman is a bit leaner than some previous Aquamen, almost Aparo-esque, fitting for someone who swims as much as he does (Aquaman, not Aparo). Mera is, of course, stunningly beautiful, but they stay away from the Lady Death-esque proportions that I think got out of hand in the last couple issues of the previous series. With Aquaman shipping twice a month, it will be interesting to see how the book holds up visually, from issue to issue, with the different art teams. Walker is pretty good at giving his characters distinct facial reactions, something other than the gritted teeth thing that is most superheroes' stock in trade. Overall, I liked this new Aquaman #1 very much. Abnett isn't trying to reinvent the wheel here (thank Neptune), but from his other comic work we all know he is quite capable of finding new and interesting ways of using the toys the DC and Marvel superhero universes offer, and I fully expect that combo of realizing what worked before/finding new things to do to continue. Now let's see if we can get this Aquaman series to issue #76! Aquaman #1 is on sale now. 76 would be great. And bimonthly will get us there twice as fast! Great issue! Feels like a return to greatness with this team. Odd that both Amnesty Bay and Spindrift Station are now in Massachusetts. I was hoping that was a mistake in the Rebirth issue, or that Spindrift was somewhat mobile, but it just doesn't make sense for Amnesty Bay to be moving. Loved this first issue, though. I can't wait to see what else will happen with the story they've set up. Noah, we checked with DC and Amnesty Bay has always been located in MA as seen in Aquaman #1, 2011 where Aquaman leaps on the scene in Boston and then has dinner at Sam's Seafood shortly after. Jeff Parker and the interim editor between runs made the error of identifying the wrong state as Maine. Ah, thanks for clearing that up. I should give my earlier New 52 Aquaman issues a reread!